Next week, ZZ Top - you know, "That Little Ol' Band From Texas" - will release a four-song digital collection called Texicali, but you can hear one of those cuts, a stunning piece of boozy, bluesy greatness called Consumption, right now. As an appetizer before the main course - and Texicali serves as a preview of the as-yet-untitled album to be released later this year - Consumption bodes well for things to come: The groove is fat, crunchy and full of swagger - Frank Beard's drums have a particularly splashy off-the-floor feel. Billy Gibbons' rhythm tone is white hot, his pinch harmonics are sharp enough to draw blood, and his slide playing is packed with playful, delirious spirit. Best of all, the song throws some deliciously unexpected audio and band performance dynamics at you. This is ZZ Top crankin' up some fresh, vital roadhouse blues. Consumption joins the songs I Gotsta Get Paid, Chartreuse and Over You on Texicali, due out 5 June. The four tracks, like the forthcoming album to be issued via American Recordings, were produced by Rick Rubin and Gibbons. 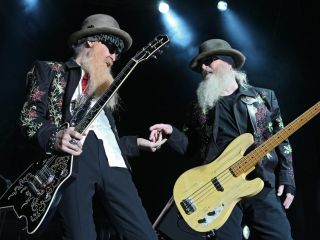 Be sure to keep it locked on MusicRadar for an exclusive video look at the guitars and gear that Billy Gibbons uses on stage with ZZ Top - featuring none other than the Reverend Willie G himself.